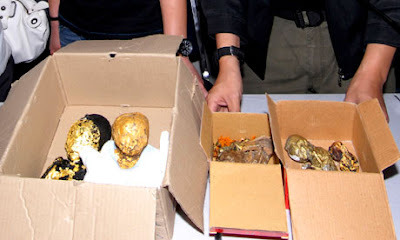 A 28 year old British citizen, Chow Hok Kuen has been arrested in Bangkok on suspicion of smuggling human infant corpses for use in black magic rituals after the bodies of six babies were found in a suitcase in a hotel room.The bodies belonged to babies aged between two and seven months, report suggests they were aborted human foetuses rather than dead full-term babies. Some of the remains had been covered in gold leaf, said police, apparently for use in black magic rituals. The authorities said the remains were bought from a Taiwanese national for 200,000 baht (£4,000) and could have been sold for six times that amount in Taiwan, where it is thought they were to be smuggled. Kuen faces one year in prison and a 2,000-baht fine if he is found guilty. The Foreign Office said it was aware of the man's arrest, but would not confirm his name or any details of the allegations against him.